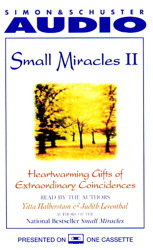 With over half a million copies sold, Small Miracles opened the hearts of people all over the world with real life stories of remarkable coincidences. Now, authors Yitta Halberstam and Judith Leventhal have assembled a collection of new stories, each recalling a coincidence that is moving, heartwarming, and inspirational. These wonderful stories -- that point to the possibilities, the blessings, and the profound meaning of our lives -- will touch your life forever.